Older than Hyrule itself is the mythical Sacred Realm, the resting place of the Triforce spoken of only in legend. For ages, Hyrulian folk tales spoke of this realm as though it were another world altogether, far removed from the reach of mortal men. The three great goddesses, their labors completed, departed for the heavens. And golden sacred triangles remained at the point where the goddesses left the world. Since then, the sacred triangles have become the basis for our world’s providence. And, the resting place of the triangles has become the Sacred Realm. Because of the many stories surrounding its connection to the Triforce, the Sacred Realm has been at the center of many of the conflicts throughout the series’ history so far, but we have never actually seen the holy land directly. Now Skyward Sword promises to depict another world in the heavens, a realm apart from Hyrule: Skyloft. Could it be that this land above the clouds is itself the ancient Sacred Realm? Some of our more dedicated readers might be thinking, “Why bother to think about whether the Sacred Realm might be connected to Skyloft?” It’s a fair question; the Sacred Realm has done fine as a mysterious Eden-like paradise far removed from Hyrule in the other games, and isn’t exactly begging to make a direct appearance in any newer game. From what we know about the game’s story, however, there may be some potential there for a relationship. The most obvious cue is one you’re probably all used to by now: Skyward Sword is set before Ocarina of Time. All we know about this period in Hyrule’s history is that there was a lot of controversy and bloody scandals involving the Sacred Realm and that the Sages found it necessary to seal off the gateway to that land by building the Temple of Time. Thus, it would only be fitting for the Sacred Realm to play some role in the plot of a pre-Ocarina game. What that role might entail is pretty open to interpretation, but two likely possibilities, depending on how the events of Skyward Sword relate to those two known chapters in Hyrule’s ancient history, are that the realm could be the forbidden fruit the bad guys are hunting for or perhaps even part of the setting. The former prospect would be nothing new, but the second offers a wealth of opportunity for interesting and unique set pieces: my personal bets are on both. We’ve heard already of the importance of the separation between the two worlds, and there’s no denying that the idea bears at least a passing reminder of the similar distance between Hyrule and the Sacred Realm. The fact that the surface world is plagued by evil while Skyloft (as far as we know) still remains pure may further demonstrate the similarities, as the seals on the Sacred Realm exist to protect it from the evils that might try to dominate it. Perhaps Link’s quest in this game is to prevent the bad guys from circumventing these security measures to get into the Sacred Rea- I mean, Skyloft. Of course, Nintendo often includes familiar stories and elements simply for familiarity’s sake, so these parallels may prove to be nothing more than a cheap homage. The original official art for the Sacred Realm depicts it as a series of floating islands decorated with ruins that look like they came straight out of ancient Rome. While we haven’t yet gotten a detailed look at Skyloft yet, this portrayal is highly evocative of the stories of Olympus, the dwelling place of the gods in Greek and Roman mythology, which of course was also a land above the clouds. Otherworldly kingdoms in the sky where the gods reside also happen to be pretty commonplace among legendary fantasy tradition, including Nintendo’s own Kid Icarus franchise. It’s entirely possible that, like many other locations in the series, the Sacred Realm could have received a “re-imagining” treatment and that what we know as Skyloft may be a city or region within that realm. 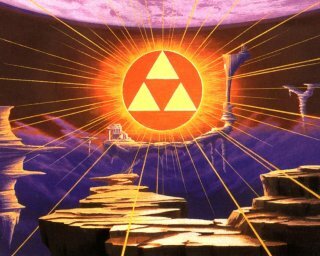 On the other hand, Nintendo has been pretty consistent about depicting the Sacred Realm as “a different world entirely,” only accessible through magical means such as the gateway in the Temple of Time or the warp tiles scattered across Hyrule. Furthermore, the Sacred Realm was said to be a parallel mirror to the Light World in A Link to the Past, and indeed its transformation into the Dark World very closely mimicked Hyrule’s landscape. Neither of these descriptions really allows for us to interpret the Sacred Realm as a literal land in the heavenly expanse of Hyrule’s skies. For every Zelda game we tell a new story, but we actually have an enormous document that explains how the game relates to the others, and bind them together. But to be honest, they are not that important to us. We care more about developing the game system… give the player new challenges for every chapter that is born. It seems that even though the Zelda tales are “bound together” in a chronological way, they are still very much each separate stories, not restricted by previous entries. So if Nintendo wants to depart from their traditional depiction of the Sacred Realm as a mirror to Hyrule, they certainly have the freedom to do so. We have already seen an example of this in Ocarina of Time, where the Temple of Light, the one place from the Sacred Realm that we visit in-game, doesn’t directly resemble anything from Hyrule. The word translated here as “previous residents” is “senjuu no tami,” which literally means “the people that dwelt before,” or in other words a group of people who once resided in a particular place. It seems that at one time, long before the Sacred Realm was infiltrated by evil, there was a nation of people who resided within the realm itself! Since Link is a Hylian, could it be that the Hylian race, the people chosen by the gods, once guarded the Sacred Realm from within? This kind of development would make for an interesting twist on the traditional Sacred Realm legends we know and love. Of course, this is all speculation. Will the Sacred Realm appear in Skyward Sword at all? Or are these just the ramblings of a Zelda nerd’s big imagination? We’ll have to wait for 2011 to know for sure how it will all play out. The Skyward Sword Speculation Series is a new regular column that will focus on speculated possibilities for Skyward Sword’s gameplay and storyline. The idea came from a general speculation article we published in the wake of E3. While we try to make our guesses based on confirmed or suggested facts, bear in mind that they are still just that – guesses – and may or may not prove to be true, or even at all accurate.